On the open end begin to string ornaments onto the twine, in groups of 3 (ex. 3 medium, then 3 small ornaments and so forth). Make sure to push the ornaments together as you string them but be careful to not pack the ornaments too tightly as you will need a little give in the strand of garland to create the loosely draped look when hung. Personally, I am fine using small nails on the back side of my railing to anchor the garland. 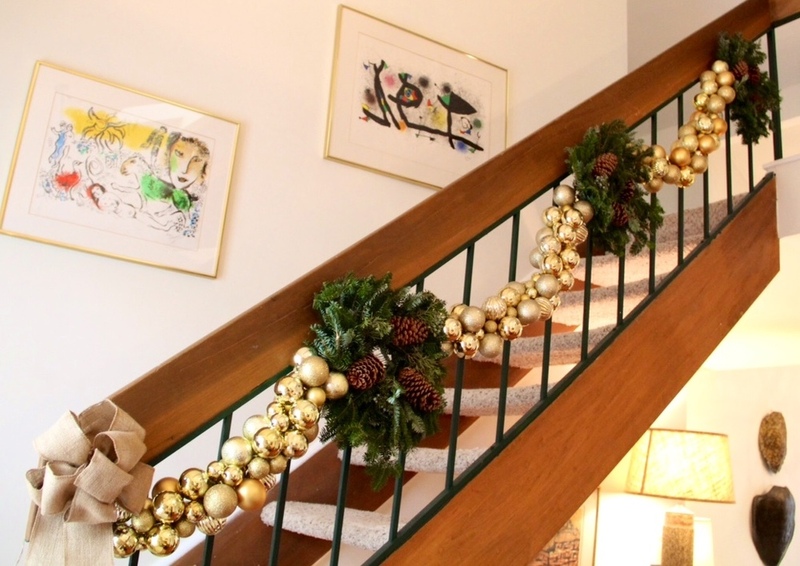 However, if you are not ok using nails on your own bannister, you can use additional twine to secure the garland. Just make sure to always tie bows when securing so that it's easy to adjust this garland when you are decorating. You can use large holiday bows, fresh wreaths or a combination of both to accent your garland display. When it's time to take down the garland, I label each strand in ascending order so that I know where each one goes when I decorate my bannister next year. Nothing like a little garland paired with a few wreaths to really get me in the holiday spirit! I've got a busy weekend of decorating and holiday to-do's ahead of me, but at least I can feel somewhat accomplished having my staircase decked out and ready for the holiday season. Next week I will finally be revealing our family christmas tree! I have literally been counting down the days in anticipation for christmas tree shopping. You really can't beat the smell of a fresh tree and oh how I love the tree lights! Anyway, stay tuned more to come!